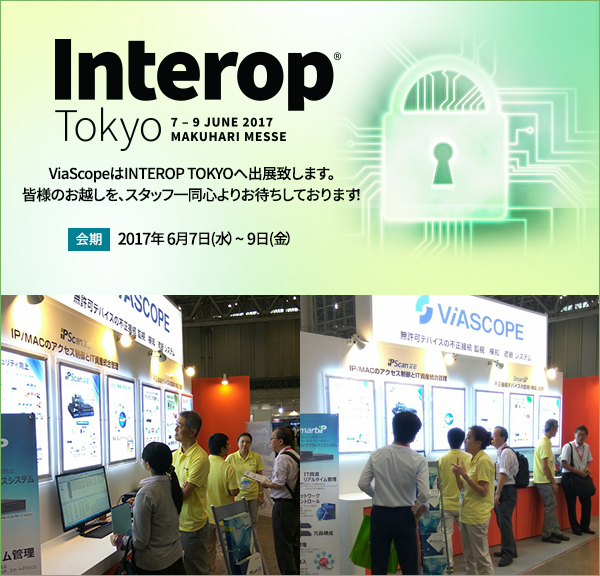 ViaScope @ Japan's largest security exhibition INTEROP Tokyo 2017. > Leader in Network Access Control ViaScope! ViaScope @ Japan's largest security exhibition INTEROP Tokyo 2017. ViaScope Inc. is the 'ShowNet' sponsor of this event, allowing them to manage and control devices connected to the entire network and experience them directly. 'ShowNet' is a special project of 'Interop Tokyo'. It has installed internet network in the exhibition hall with products and services provided by exhibitors, and over 400 engineers designed, constructed and operated the network during the exhibition. Demonstration is a project that provides verification and experience of various products and interoperability.